‘Nduja is considered a typical product of Spilinga, a small town in the province of Vibo Valentia in Calabria. Every August, the town hosts an ‘nduja festival. The origins of ‘nduja are unclear. Some claim that it was invented in the 1500s when the chile pepper was introduced to the region. Others say that it dates to the 19th Century when Calabria was under Napoleonic control. The name, is said to derive from the French andouillette which is a similar but not spicy sausage. However, this too only dates to the early 19th Century. ‘Nduja is soft and spreadable and it usually eaten on bread or as an accompaniment to cheese. As well as in its traditional sausage form, it’s also sold in jars as a kind of pâté. But it also makes a quick and easy, and very tasty, pasta sauce. I make it as a slightly more substantial version of spaghetti aglio, olio, peperoncino. ‘Nduja is very red and it can stain things easily if you’re not careful. Always mop up any spillages on worksurfaces and so on immediately. Also, as it’s made of chiles, avoid touching your eyes after handling it. Bring the water to the boil. When it is boiling well add the salt. Cook the spaghetti in the water according to the manufacturer’s instructions, about 10 minutes. Heat the olive oil in a large frying pan or skillet. Add the ‘nduja and water and stir with a wooden spoon until the ‘nduja has dissolved. Cook for about five minutes and then turn off the heat. Just before the spaghetti is ready, reserve a little of the cooking water. Drain the spaghetti and add it to the sauce. Stir well until the spaghetti is completely covered in sauce. Add a little of the cooking water if necessary. Serve the spaghetti with freshly grated parmigiano reggiano on top. 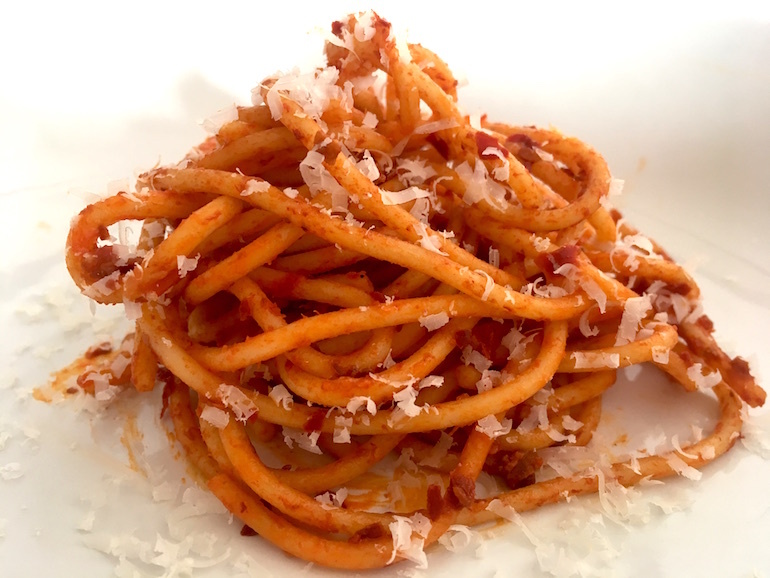 Have you tried ‘nduja? What do you think? How did you eat it?